Parties are fun and it is something that people of all ages can celebrate. Whether it's your child's 1st birthday or your grandfather's 90th, your wedding reception or an engagement, make your party planning experience fun, easy, and deliciously tasteful with Basic Kneads Pizza! Wow your guests with our variety of premium quality pizzas that are cooked onsite with our special home-made dough and sauce, and mouth-watering toppings. ​​Don't have much room? No worries, our portable oven can squeeze into the smallest of spaces - from terrace houses to back patios. Here at Basic Kneads Pizza, we pull up, set up, and get ready to party! ​Are you planning a birthday celebration for your child? For an awesomely fantastic party, we offer a fun-filled Pizza Party to remember that your child will truly love! ​Contact us today for a reservation. Our service can be tailored to fit your needs. With our mobile pizza catering service, we can go anywhere a car can park to make your event a memorable one. ​Catering to both indoor and outdoor events, we bring everything including the staff to prepare and cook pizza onsite, right in front of your staff and team making the whole experience fun and mouth-wateringly delicious for everyone. ​All our premium quality pizzas are baked on-site in our mobile oven, serving them bubbling hot and fresh from the oven. So for your next company event, invite us to bring and prepare a pizza feast for you while you sit back and relax to enjoy the day. At Basic Kneads Pizza we appreciate how important your special day is to you and your family. We have the ability to cater for small or large groups as our ovens can produce a large amount of pizzas in a small amount of time. We are excited about the prospect of making your wedding the perfect day you have always dreamed of. We have plenty of reviews on our Facebook page and website testifying the quality of our products and service. 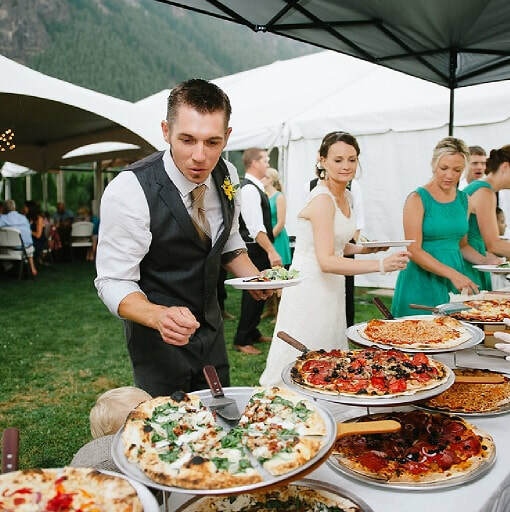 A pizza Buffet is a great affordable option for a wedding. Our pizzas are displayed on our elegant stainless steel platters and stands which make a stylish addition to your wedding décor. Our pizzas are continuously replenished. We also have other food items such as salads and pastizzi which complement our pizzas perfectly. Our service is complete with our delicious dessert pizzas. Our Nutella pizza is to die for!!!!!! !